GoldFax is the ultimate solution for fax delivery. 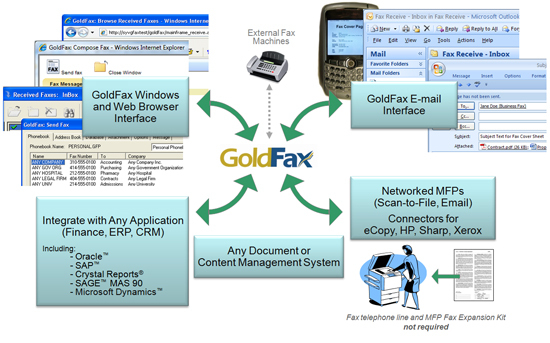 GoldFax gives you enterprise fax server functionality at a small business price. It is a high performance enterprise fax server software. GoldFax is fully scalable (supporting 120+ fax lines per server), and can be used to automate fax communications by any organization: small business, department workgroups, and enterprise corporations. GoldFax eliminates all of the limitations of conventional paper-based fax devices and significantly improves your fax document productivity, security and compliance, while reducing your operational costs. GoldFax is the most efficient, most flexible and best value business fax solution on the market. Network faxing allows you to use server based technology to send, receive, organize, manage and store faxes for your entire enterprise. GoldFax allows you to send and receive faxes from your desktop, mobile devices, integrated MFPs (Multi-Function Printers), and production applications. You no longer have to print out documents and lose quality, security, and privacy. No more waiting and standing in front of the fax machine. No more lost faxes. Web browser - Internet Explorer, Firefox, Safari, etc.